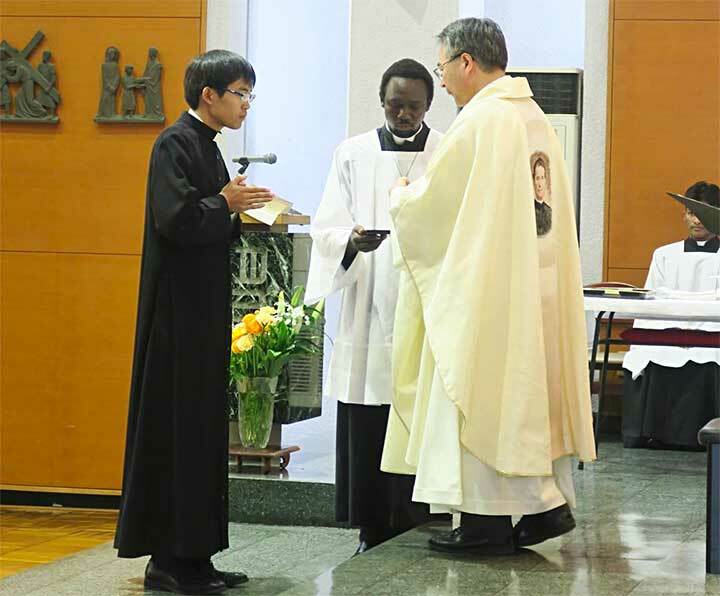 Tokyo, Japan, 25 March 2019 -- At 2 pm, the Feast of Annunciation of the Lord, young novice Maximiliano Maria Kolbe Arakawa took the first profession of vows and started his vocation as a Salesian, especially for poor youth, at Chofu Salesian Seminary (Tokyo), before God, with around 200 people witnessing. In his homily at the mass, Fr Provincial, Jacob Hamaguchi, SDB said , "As you walk the religious life, please pray to and imitate Our Lady St Mary, who was whispered to by God and invited to give birth and raise Jesus, and said Yes. Please live according to the desires of God and your vows. I also hope today will be a good opportunity for each of the participants to respond again to God's invitation with joy." 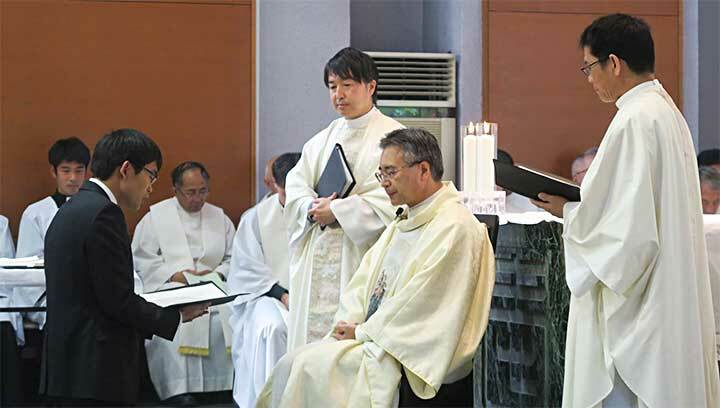 Fr Paul Tamura, SDB, the Rector of the Chofu Salesian Seminary, who was in charge of the introduction of the new Salesian today, said, “From violin to rakugo (Japanese traditional comic storytelling), Arakawa-san is truly versatile, and for the spiritual preparation for today, he walked with prayers from Fukuoka, his birthplace, to Nagasaki, the place of execution of Japan 26 saints. Arakawa-san, when you profess your perpetual vows, please walk from Kyoto, the starting point of the 26 saints to Nagasaki. It will be a long-way, but a very good pilgrimage! " (Laughs) . And Fr Provincial added at once "Arakawa-san, I will see you off in Kyoto at that time!” The chapel broke out in laughter. Fr Provincial also encouraged him to walk the religious life always with everyone, and with joy as a Salesian of Don Bosco. Cl. 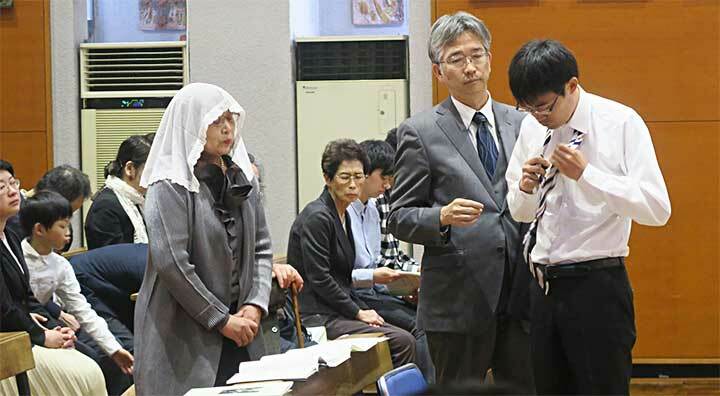 Arakawa, who stood for a last greeting, expressed gratitude to the Salesians, his family members, and the participants, and said, "Because the days of the Novitiate were so enjoyable, I asked Fr. Michael Lap Haruyama, SDB, ‘please let me train for one more year.’ But his answer was of course ‘No.’ (Laughs) Today I have dedicated myself to God, and my parents also have dedicated me as their only son to God. I will continue to pray for you everyone, so please pray for me, too, " he said, and received warm applause. Unfortunately, there are no novices in Japan from April. Today, everyone shared the joy of the birth of a new Salesian, but more your continued prayers and support for more vocations for Salesian priests and brothers are most welcome! 5050_'YOUNG - FREE - HOLY'! 5049(II)_What makes you happy as a Salesian Cooperator? 5048(IV)_"Wake Up The World and Enlighten The Future"